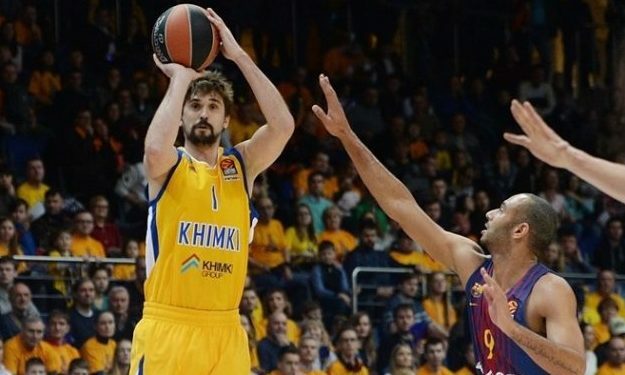 After a campaign that saw him shatter records and bring his team to new heights, Alexey Shved of Khimki Moscow Region is the winner of the Alphonso Ford Top Scorer Trophy for the 2017-18 season. The Ford Trophy is awarded annually to the Turkish Airlines EuroLeague player with the highest scoring average over a minimum number of games. It is the EuroLeague’s only end-of-season award that does not rely on voting by fans, media or coaches, but is based solely on statistics. To win the award, Shved averaged 21.76 points while starting in each of Khimki’s 34 games this season. Shved made history by shattering the single-season record for points scored with 740, surpassing the previous mark of 609 set last season by Keith Langford of UNICS Kazan. He also established the longest streak of games this century with at least 16 points scored by doing so in 29 consecutive games to start the season. Additionally, Shved set EuroLeague records for three-pointers made (107) and attempted (324) in a season and points scored (36) and three-pointers made (8) in a playoff game.